I've seen this error in a few other areas of the forums; however, I'm trying to understand what does "key 'privateKey'" means. I'm trying to authenticate to a VPN portal and this is the error that pops up when I browse to the site. I was provided a .pfx file, imported it into my "login" keychain, and now I'm trying to use it when browsing to this site. Perhaps my understanding of all of this is horrible, but I thought I'd at least post about it and see if anyone could provide any valuable feedback. 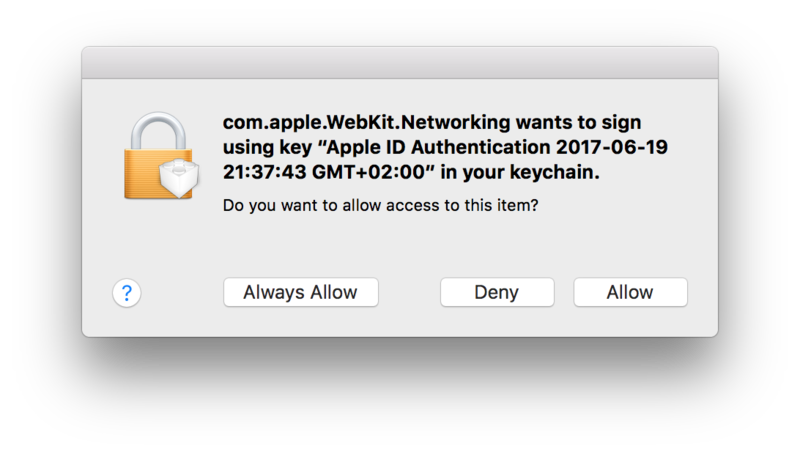 Also, that "using your key 'privateKey'" is not very specific, so I have no idea whether it's trying to use the right private key or not. *.pfx file is in PKCS#12 format and includes both a certificate and a private key. When you imported the file to your keychain both the certificate and private key got imported to your keychain. In general you first select a certificate to be used in an application or website. So in order to sign you in access to the associated private key needs to be granted. That is why you get a prompt with options: "Always Allow" / "Deny" / "Allow"
Note: my understanding is also limited. I came across your AskDifferent question by searching for a solution to an issue that blocks Allowing / Allways allowing access. Not the answer you're looking for? Browse other questions tagged keychain certificate websites .